With your hands you have potential to relieve everyday aches, pains, and ailments without taking drugs, to improve your health, and to increase your vitality. Acupressure is an ancient healing art that uses the fingers to stimulate key points on the skin that, in turn, activate the body's natural self-healing processes. With this book, it is a skill you can learn now -- and use in your own home. In Acupressure i Potent Points, Michael Reed Gach, founder and director of the Acupressure Institute of America, reveals simple techniques that enable you to relieve headaches, arthritis, colds and flu, insomnia, backaches, hiccups, leg pain, hot flashes, depression, and more using the power and sensitivity of your own hands. 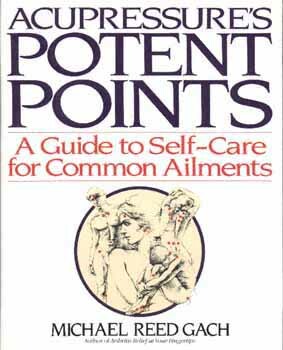 This practical guide covers more than forty ailments and symptoms, from allergies to wrist pain, providing pressure-point maps and exercises to relieve pain and restore function. Acupressure complements conventional medical care, and enables you to take a vital role in becoming well and staying well. With this book you can turn your hands into healing tools and start feeling great now.